PM Narendra Modi has announced the setting up of Sardar Patel Award for National Integration while addressing the conference of DGPs/IGPs in Gujarat’s Kevadia. The countries first Home Minister Sardar Patel had devoted his life to unifying India. On the occasion, PM Modi also released a commemorative stamp on the National Police Memorial. Tamil Nadu has announced the setting up of country’s first music museum with assistance from the Central government in Thiruvaiyaru which is the birthplace of Saint Tyagaraja, one of the Trinities of Carnatic music. The other two of the Trinity are Muthuswami Dikshitar and Syama Sastri. Saint Tyagaraja has composed thousands of devotional compositions, mostly in Telugu in the praise of Lord Rama. India celebrates National Farmers Day on 23rd December to commemorate the birth anniversary of the 5th Prime Minister of India (1979-1980), Choudhary Charan Singh. He was a farmer’s leader and he had introduced many policies to improve the lives of the Indian farmers. He is often referred to as the ‘champion of India’s peasants. He became the first non-Congress chief minister of UP. His memorial in New Delhi is named as Kisan Ghat. PM Modi on 24th December 2018, a day before Vajpayee’s 94th birth anniversary released a commemorative coin worth Rs 100 in honour of former prime minister Atal Bihari Vajpayee. The front side of the coin features the Emblem of India. 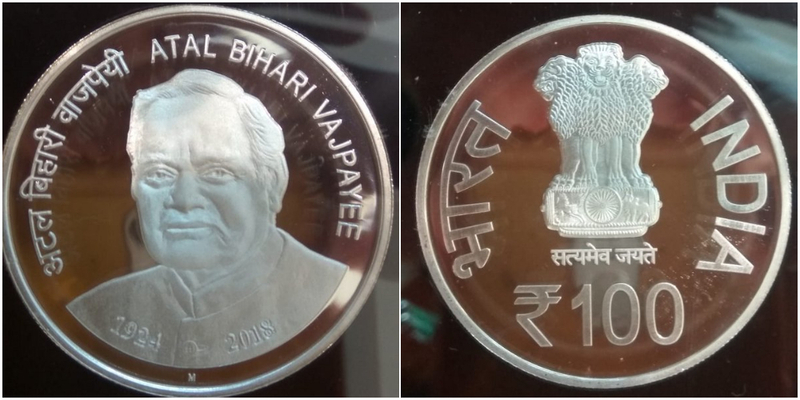 The reverse side of the coin features a portrait of Atal Bihari Vajpayee and his name is inscribed in both Devanagari and Roman scripts. The years 1924 and 2018 are inscribed below Vajpayee’s portrait to mark the year of his birth and death respectively. Atal Bihari Vajpayee served as the Prime Minister of India for a term of 13 days in 1996, then for a period of 13 months from 1998 to 1999, and finally, for a full term from 1999 to 2004. The Indian Navy has been commissioned a naval hospital ship, the INHS Sandhani at Naval station Karanja in the Raigad district of Maharashtra. INHS Sandhani was flagged by Flag Officer Commanding-in-Chief (FOC-in-C) of the Western Naval Command Vice Admiral Girish Luthra and the commissioning plaque of the hospital was unveiled by the Preeti Luthra, President of NWWA (Navy Wives Welfare Association), Western Region. INHS Sandhani is the tenth one commissioned by the Indian Navy. The 55th anniversary of Sashastra Seema Bal (SSB) was held in New Delhi on 24th December 2018. SSB is part of the para-military force of India. After the Chinese incursion of 1962, Special Service Bureau was created in March 1963. The SSB was renamed as the Sashastra Seema Bal in January 2001. The National Consumer Day was observed across India on December 24, 2018 with the theme “Timely Disposal of Consumer Complaints”. On this day, the Consumer Protection Act, 1986 was enacted with the objective of providing better protection of consumer’s interest. The Economic Advisory Council to the Prime Minister (EAC-PM) has constituted a Logistics Development Committee under the Chairmanship of Dr. Bibek Debroy, Chairman of EAC-PM to assess key challenges and suggest reforms in logistics development and associated commerce. It is designed to fundamentally re-engineer the existing business processes of the government and intended to facilitate an integrated “whole of the trade value chain” approach. 1. Which state announced the setting up of country’s first music museum? 4. PM Modi released a commemorative coin worth ____ in honour of former prime minister Atal Bihari Vajpayee? 4. What was the full term of Atal Bihari Vajpayee as the Prime Minister of India? 5. In which year Sashastra Seema Bal was created? 6. On which day National Consumer Day is observed in India? 7. Who is the chairman of Logistics Development Committee?